Dr. Graciela Chichilnisky worked extensively on the Kyoto Protocol, creating and designing the carbon market that became international law in 2005, and wrote the wording for the carbon market into the Kyoto Protocol at the COP in Kyoto in December 1997. She is professor of Economics and Statistics at Columbia University, NYC, and is currently a Visiting Professor at Stanford University and the CEO of Global Thermostat. She holds two Ph.D. degrees, in Mathematics and Economics from MIT and University of California Berkeley. 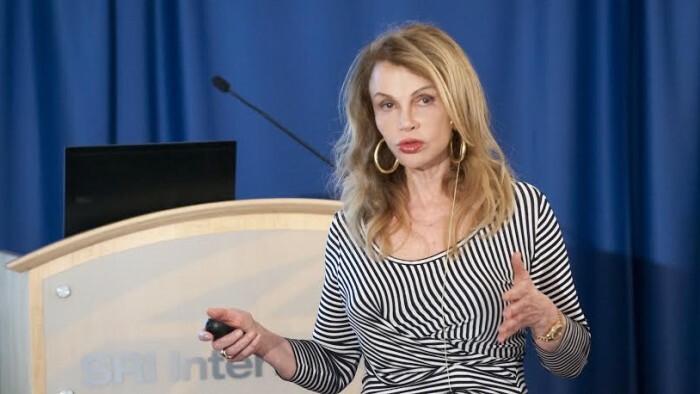 She is a frequent political and economic speaker on CNN, ABC, BBC TV News, and Bloomberg News, as well as a frequent keynote speaker at leading international conferences and universities. She taught previously at Harvard, Essex and Stanford Universities, appeared in Time Magazine on “Heroes of the Environment,” and was elected one of the Ten Most Influential Latinos in the U.S.
Where do you see the most exciting research/debates happening in the field of climate science? In two areas: one is technology – finding exciting new ways to clean up our atmosphere while producing the clean energy we need for overcoming the abject and inhuman poverty experienced by over 1.3 billion people who have never had access to electricity and who don’t know where their next meal is coming from. The second area is in the fields of cognitive science and political science in the hope of overcoming the limits of our brains and of our societies in tackling change and resolving constructively the new and critical problems of the 21st century – facing change and promoting a constructive access to and use of the earth’s resources – without resorting to unnecessary and destructive war and violence, to killing each other. I have been thinking more or less the same way for the last forty years or so, remarkably I have not changed much in my way of understanding the world. My thinking evolved and was refined but has not really changed much. What prompted my original thinking is real world observation, while I was growing up in Argentina, of the use and misuse of the world’s resources by poor and rich nations alike – and particularly by the latter of course. The Kyoto Protocol was the first climate change global agreement. What was its import and is it still valid? The Kyoto Protocol can be improved but it already has the two necessary conditions for resolving climate change: (1) mandatory limits on the nations of the world on their use of the atmosphere of the planet to emit CO2 – without which we cannot resolve climate change and (2) the flexibllity to achieve those mandatory limits in the form of the carbon market (EU Emissions Trading System) that provides a global price for carbon – without which market prices and measures of economic growth such as GDP are hopelessly wrong and out of date. The use of the carbon market’s revenues (the CDM) to create and deploy carbon negative energy like carbon negative power plants in poor nations is a key tool fort implementing the solutions that exist today. It must be said that the Kyoto Protocol succeeded in these two goals: (a) the nations that participated in the carbon market demonstrably decreased their CO2 emissions by 27%since 2005 and (b) the KP carbon market reached trading levels of $165Bn/year by 2011, contributing over the period since it became international law in 2005 over $170Bn in order to fund clean technology and green private projects for poor nations – a wonderful record by any measure. Why did the U.S. refuse to ratify the Kyoto Protocol, and what were the consequences of that decision? The 1997 Byrd-Hagel Resolution, which was passed unanimously by the US by the US Senate with a vote of 95 to 1, refused to accept mandatory emission limits unless the developing nations also adopted the same rule and if the emission limits did not cause damage to the US economy. The US has stuck to this position and refused to ratify the Kyoto Protocol even if they did sign the Protocol in 1997. However, both of these issues can be overcome now. I proposed mandatory emission limits on developing nations that are contingent on poor nations’ receiving the funding needed to deploy carbon negative power plants. These are power plants that remove existing CO2 directly from the atmosphere while they produce electricity. An example is the SRI – Global Thermostat’s carbon capture plant operating at 333 Ravenswood Ave., Menlo Park California. It produces electricity and removes CO2 from air and from the flue of the power plant. On the second issue, these carbon negative power plants are commercially viable in that they produce profits and create jobs and exports, so the second issue in the Byrd-Hagel Resolution can also be overcome. Why has this not been noticed and implemented? Because it is a process just under way, and change takes time, although time is not on our side. In fact, it would be fair to say that it is now a race against time. How would you compare the success of the Kyoto Protocol with that of the Montreal Protocol on Substances that Deplete the Ozone? They address similar issues – except that CO2 is a much tougher problem: CO2 is a global public “evil” because it is distributed uniformly throughout the whole world so the CO2 concentration is the same today in Beijing as is in Morocco, which is not true of SO2; furthermore, furthermore 45% of the world’s CO2 emissions come from power plants so CO2 emissions have been inexorably tied to economic growth which is also not true of SO2;, and, finally, CO2 remains in the atmosphere for hundreds of years while SO2 decays fast. The chemical characteristics of CO2 as a gas has left poor and rich nations alike with a cruel choice, one which is of course much worse for the former: the choice has been between less economic growth or a deteriorating atmosphere. This cruel choice has now changed because companies like Global Thermostat in Silicon Valley have created “carbon negative power plants” that can simultaneously clean the atmosphere of CO2 and at the same time produce energy for economic development. This is exactly how the Montreal Protocol succeeded: by finding a profitable way to replace CFCs. Now, for the first time, we have a similar solution for CO2: a profitable way to clean the atmosphere. The jury is out on whether we as humans have what it takes to avoid the destruction of our civilization. The Paris COP21 agreement has been hailed by world leaders as a huge diplomatic success, but it has been severely criticized by environmentalists as well as by you. What do you consider to be the main problem with the Paris climate change agreement? The main problem is that there is nothing mandatory and no action plan at all in the Paris Agreement. It is really an expression of hope and an agreement about the seriousness of the situation, but for an agreement to have been reached it was apparently necessary to eliminate any references to all mandatory aspects of the treaty. What should have happened — and could have easily happened — in Paris is an extension of the Kyoto Protocol so that all nations have mandatory limits, with the poor nations pledging only those limits that they are paid to implement from the funds of an extended carbon market, as explained above. Lack of knowledge and the complexity of the issue interfered in the attainment of a viable solution and what remains is just a statement of good intentions with nothing to back them up. What are the main dangers facing humanity as a result of unchecked climate change? As the North and South poles melt and the sea level rise engulfing coastal areas and billions of people in 43 island nations, we face a continuous and worsening condition of massive human migration accompanied by economic disruption and political upheaval which result in major security threats, instability and extremism. In a word, we face the end of human civilization as we know it. The IPCC 5th Assessment Report of November 2014 requires now the removal of existing carbon from the atmosphere in order to avert a catastrophic climate change scenario (see page 191 of the Report). This is possible with existing technologies that remove CO2 directly from the air. They are low cost now and selling the CO2 that is captured from the air is starting to become a profitable enterprise, a commercial reality. One immediate question is whether we have enough use for the CO2, once we have removed it from the air, in order to stabilize it permanently on earth after it is removed from the atmosphere. The answer is again, yes. Examples include building materials like polymers and carbon nano fibers that can replace dry wall and steel and can reinforce cement and concrete with CO2; there is also the use of CO2 in food and beverages for the production of fertilizers and for synthetic fuels. What will it take to convince governments that there is a technological solution to climate change? I don’t know if governments alone can act or whether a new global solution may be needed going well beyond today’s international organizations. After WWII we created the first global financial institutions, i.e., the World Bank and the International Monetary Fund, and the United Nations in order to deal with change. We need a similar upgrade of our international organizations. I have written books on this issue in the past forty years, but I think the issue is much more relevant and crucial today. What is the most important advice you could give to young scholars in the field of climate science? Follow your passions and be truthful to your values. Do not compromise. The world is yours to save it. This interview was conducted by C. J. Polychroniou. C.J. Polychroniou is an international political economist/political scientist who has taught and worked in universities and research centers in Europe and the United States. His main research interests are in European economic integration, globalization, the environment, and the political economy of the United States.